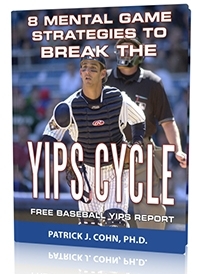 In our Sessions With Doc video series, Dr. Patrick Cohn talks about his philosophy about the yips cycle. Do you struggle with throwing down to 2nd base or simply throwing balls in a baseball game? The fears that cause you to throw a ball into the dirt or throw it over the pitchers head or the 1st baseman’s head unexpectedly. We call this the throwing yips in baseball. 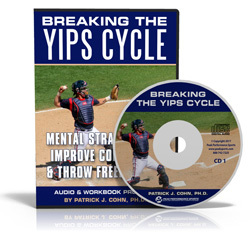 Watch the video to learn more about the yips and what Dr. Cohn says you can do to get relief and throw freely again.